Boat is located in Gig Harbor,WA.Please contact the owner @ 239-285-9245..
Only been three, "Gypsy" is looking for her next adoring owner! This wonderful, vintage, short-rig, deep-keel, sloop has an important industry history. Written about endlessly after the Chris-Craft company commissioned famed naval architects Sparkman and Stephens to design C&C's first sailboat (1963), they named her 'The Sail Yacht'. Very few of these vessels are still afloat; fewer still with caring owners. For many years she was kept in freshwater in Tennessee, of all places. She has been well-maintained over the years by only 3 owners. We have had her since 1998 and she has sailed the Atlantic, Caribbean, Florida Keys, Gulf of Mexico and currently Puget Sound. DRAFT: 4'8" BEAM: 11' ENGINE: Perkins 50 4-108 DINGHY: Zephyr inflatable with Coleman 2.5 hp 4-cycle outboard motor SAILS: (5) Large Main, Genoa, Working Jib, Storm Tri-Sail, Spinnaker, all in good condition, sailbags HULL: Heavy 1" fiberglass, water-tight, well-maintained (diver bottom scrubbed regularly); no holes or blisters TANKAGE: 110 gals. Diesel; 60 gals. fresh water (two tanks each), 3/4 gal./hr. fuel consumption ELECTRONICS: Garmin GPS, new Uniden marine radio (+antenna), new Uniden handheld 2-way vhf marine radio, auto-pilot, depth-finder BATTERIES: (5) 4 deep-cycle "house" batteries; 1 dedicated starter HEADS: Fore-cabin bathroom with commode, fresh water sink, hand-held shower: aft cabin separate commode, closet GALLEY: Freshwater faucet in sink, icebox, 2 gimbaled gas burners, new microwave, cabinets and storage closet ACCOMODATIONS: sleeps 4 comfortably; settee surrounding large center table converts to wide double bed in fore-cabin; two single bunks in aft cabin with closet, drawers and storage compartments ACCESSORIES: 2 Danforth anchors, gasoline generator (for off-shore battery charging), barbecue, electric blower, lines, fittings, sun showers, Ivation self-emptying dehumidifier, and lots more. Teak rail and cabin sole. Fiberglass hull, center cockpit and deck surface Mahogany doors, trim and cabinetry Oversized cockpit wheel with gimbaled compass Bimini (Sunbrella) Fixed glass windshield Vinyl zippered side curtains (full cockpit closure for foul-weather sailing) Boom sail cover Foredeck canvas cover Huge cockpit lazarettes Aft-deck "garage" 10 new USCG approved lifejackets First aid supplies Tools Maintenance equipment Gypsy is a stable, sturdy cruiser; sails with ease, and was built with much higher standards than are most modern sailboats. (Chris Craft only built sailboats from 1963-1973.) 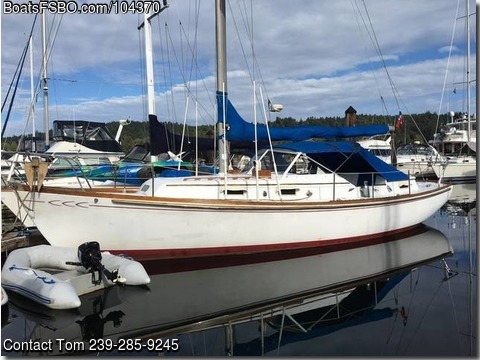 Basically, she is ready now for you to untie from her West Shore Marina moorage (optional to keep; a bargain that even has a Mt. Rainier view slip with a new dock locker) and head for a fab vacation in the San Juans! Sail her on your own, with family, or a dozen or more friends...she's a refuge, a party boat, and a great liveaboard with her private aft cabin "bedroom" that even has mounted reading lights at each berth to read yourself to sleep in a quiet anchorage anywhere. Consider living on this substantial and comfortable boat and avoid rent or mortgage payments. Really...have done it; it works! Thought you couldn't afford a big yacht, right? A boat to be proud of; she'll appreciate your care. I'm sure I've forgotten something, so be in touch with your questions or to make an appoitment if you'd like to see her.